Sorry about the static lately but ‘tis the season! And in honor of this frantic, wonderful holiday season, I want to share with you a very creative idea. I was on Facebook; ah, that great time waster, and I saw a post from a former student of mine. 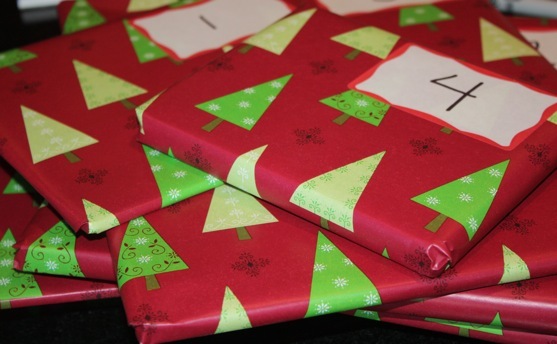 She wrapped up 24 holiday children’s books and each evening in December, she and her son will open one and read it together. What an absolutely fantastic idea! I love children’s books, especially Christmas children’s books. I research a bit and went on Pinterest, another fantastic time-waster, and discovered that one can get REALLY creative with the Advent Book Calendar idea!! To me, the holiday season should be viewed through the innocent and excited eyes of children. Every year, my husband seeks out a unique and unknown Christmas book for me, while I find treasured classics for my children. When I was little, my mom always had a basket of Christmas children’s books under the tree. I remember sitting on the floor in the glow of the fire, twinkling Christmas lights, and flashy tinsel, enjoying holiday favorites year after year. I continued this tradition with my own family. When the kids were younger, we would read a book a night before bed. As they got older and became proficient readers, everyone would pick a favorite and we would all take turns reading. Five books a night, every night until Christmas . . . yes, I have that many Christmas children’s books. Even now, I get so tickled . . . don’t tell them, they would be embarrassed . . . when my teenagers, much past the age of picture books, lie on the floor under the tree re-reading their favorites. After the holiday is over, the books are packed up in a bin and stored away until next Christmas. I think I get more excited unpacking the holiday books each year than I do unpacking ornaments! The Advent Book Calendar takes that thought one step further. Added to the excitement and anticipation of reading a holiday book is unwrapping one and not knowing which one will be found! What a lovely tradition!! As I thought about this, I pondered how I might use this with myself and my teenagers. Giggling a bit manically, I thought about wrapping up books on my to-be-read pile. I would have to read one a day to keep up with the calendar. Nothing else would get done in my house but my to-be-read pile might shrink a bit! Sigh . . . I guess I will stick with the children’s books. This entry was posted in Curl up and Cuddle, Queries and Conundrums and tagged advent, children't books, Christmas books, holiday traditions, wrapping on December 1, 2016 by kvgaughan.